This article is in a series of articles across our product platforms showing how to print different pages on different printer trays. 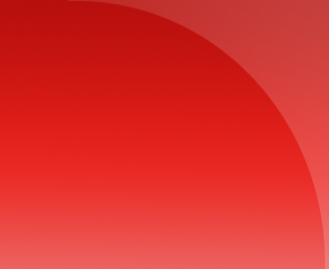 We recently provided the PDFOne .NET version. Here is the Document Studio .NET version. While PDFOne can only print PDF documents, Document Studio can print DOCX, DOC and images in addition to PDF. 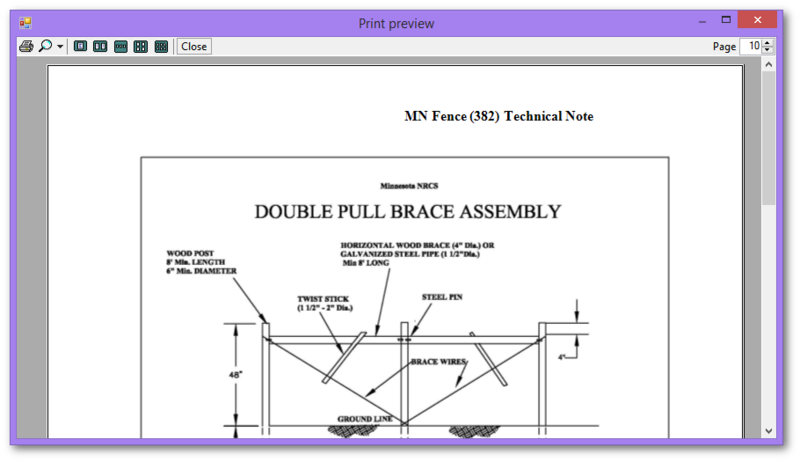 As this article was being written, some customers wanted to know how to print documents with a print preview. So, there is now a small print preview and document preview option as well. When you call DocumentPrinter.Print() method, the printer control will print to the current default printer. To change current print settings, you should access the DocumentPrinter.PrintDocument property. This DocumentPrinter.PrintDocument property wraps a System.Drawing.Printing.PrintDocument object. The PrintDocument exposes the printing subsystem available to the DocumentPrinter instance. The DocumentPrinter.PrintDocument.PrintSettings.InstalledPrinters array, for example, will provide you with the names of the currently installed printers. To change current default printer, set DocumentPrinter.PrintDocument.PrinterSettings.PrinterName property to one of the printer names in DocumentPrinter.PrintDocument.PrintSettings.InstalledPrinters. If you directly set the System.Drawing.Printing.PrintDocument.PrinterSettings.PrinterName property, DocumentPrinter will not be making any change. This is because DocumentPrinter creates its own snapshot of the System.Drawing.Printing.PrintDocument object when you call its constructor. After a printer has been selected, the number of trays in that printer can be obtained from PrintDocument.PrinterSettings.PaperSources collection. 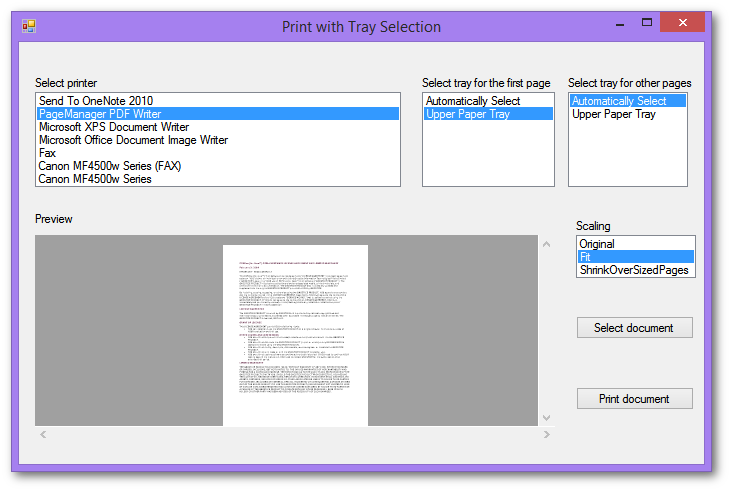 To make DocumentPrinter print to a particular tray, you need to set the PrintDocument.DefaultPageSettings.PaperSource property to one of the trays in PrintDocument.PrinterSettings.PaperSources collection. You can set the paper tray in the DocumentPrinter.BeginPreparePage event handler. The event arguments parameter for this handler includes the current page number. To identify the selected document, you can use a DocumentViewer control. However, there is a small issue in this. Currently, the DocumentViewer control locks the document preventing the printer control from reading it. In our other products, a loaded document can be reused in other controls. This feature has not yet been introduced in XtremeDocumentStudio .NET. So, for now, the viewer needs to close the document so that the printer can load it. (We will update this article when the feature is added.) 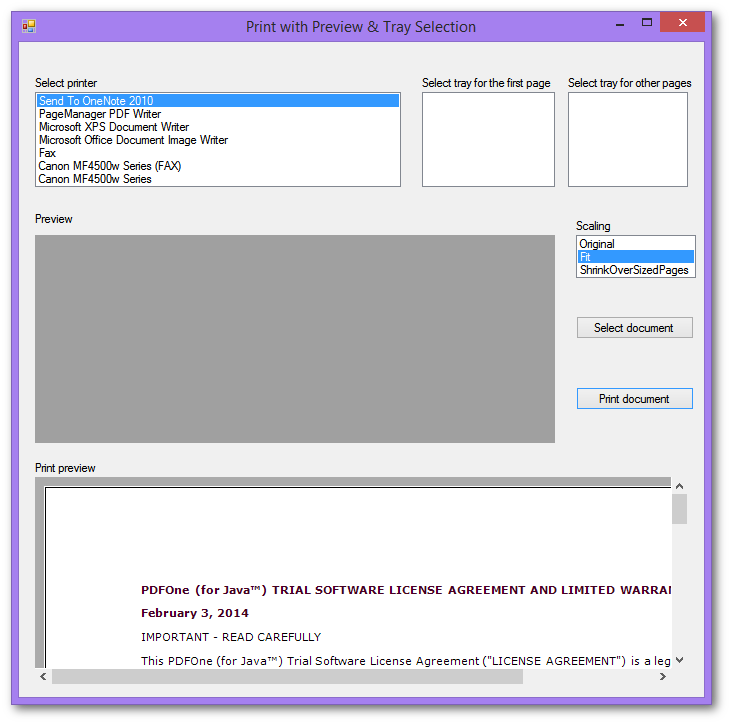 The DocumentPrinter.PageScaling options can be mapped to the DocumentViewer.ZoomType property. To print a document, you need to call DocumentPrinter.LoadDocument() with the pathname or stream containing the document and then call DocumentPrinter.Print() method. After the document has been printed, call the DocumentPrinter.CloseDocument(). There is a small issue here. The DocumentViewer control used for the preview feature has already loaded the document needs to be printed. Currently, a file lock prevents the printer control from loading the document. In our other products, a printer control can reuse a document already loaded by a viewer control. This feature has not yet been introduced in Document Studio .NET. So, for now, the preview control needs to close the document so that the latter can be loaded by the printer control. We will add this feature in the next update and update this article subsequently. In the following example, the form load event queries installed printers and makes them available in a list box. When a printer does not have more than one tray, DocumentPrinter.BeginPreparePage event handler is not set. When a file is selected, the document viewer control is used to provide a preview. The viewer control's ZoomType property is used to provide alternate previews for the DocumentPrinter.PageScaling setting. To provide a print preview, as opposed to a document preview, you can use a System.Windows.Forms.PrintPreviewDialog or a System.Windows.Forms.PrintPreviewControl control. The Document property of one of these controls needs to be set to the DocumentPrinter.PrintDocument property and its done. 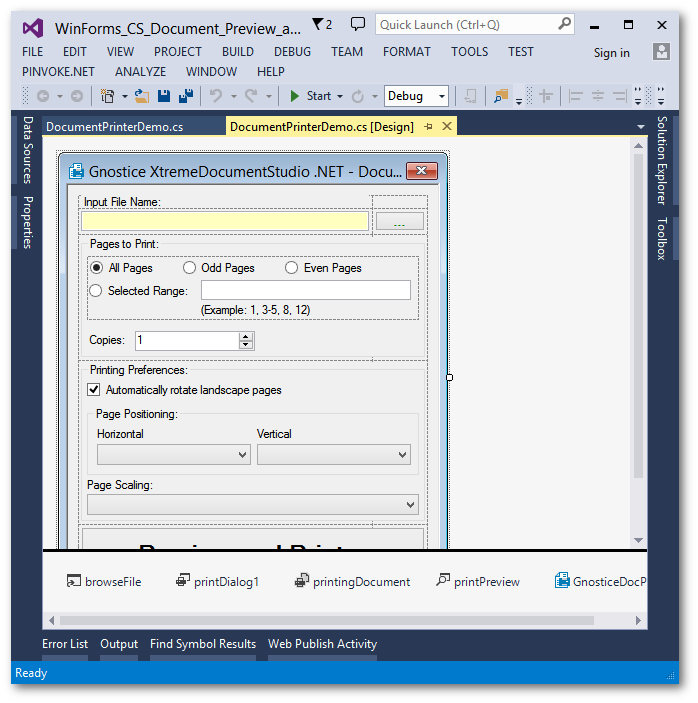 The installer/setup application for Document Studio .NET copies a source code project for a more elaborate print with preview project. It uses the System.Windows.Forms.PrintPreviewDialog control, which wraps a preview, page navigation and print control. It also provides more UI to set print settings such as DocumentPrinter.PageScaling.